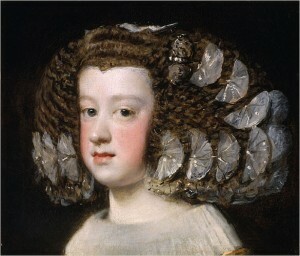 The Museo del Prado presents the exhibition Velázquez and the family of Philip IV (8 October – 9 February 2014) sponsored by Fundación AXA which will offer for the first time an analysis of the artist’s activities as a portraitist during the last eleven years of his career in the service of the Spanish monarchy, and of the continuation of his endeavours in the work of his successors, his son-in-law Juan Bautista Martínez del Mazo and Juan Carreño, during the 1660s and 1670s. The exhibition will also aim to encourage reflection on one of the most distinctive periods of Velázquez’s career and of the reign of Philip IV, who can perhaps be considered the most knowledgeable of all monarchs with regard to painting. In chronological terms, the exhibition opens in 1650 during Velázquez’s second period in Rome, at which date he had already spent more than a year outside Spain. In Rome, the artist painted around a dozen portraits of individuals associated with the papal court, of which four of the surviving six are included in the exhibition. They constitute a separate chapter within the artist’s oeuvre and one in which he markedly extended his expressive registers in order to brilliantly convey the personalities and concerns of these sitters. Also on display in this gallery are the portraits of Cardinal Camillo Massimo (The Bankes Collection, National Trust, UK), Cardinal Camillo Astalli Pamphilj (Hispanic Society of America, New York), and Ferdinando Brandani (Museo del Prado), chief clerk to the papal secretariat, the latter a new identification of a work previously known as “the Pope’s Barber”.